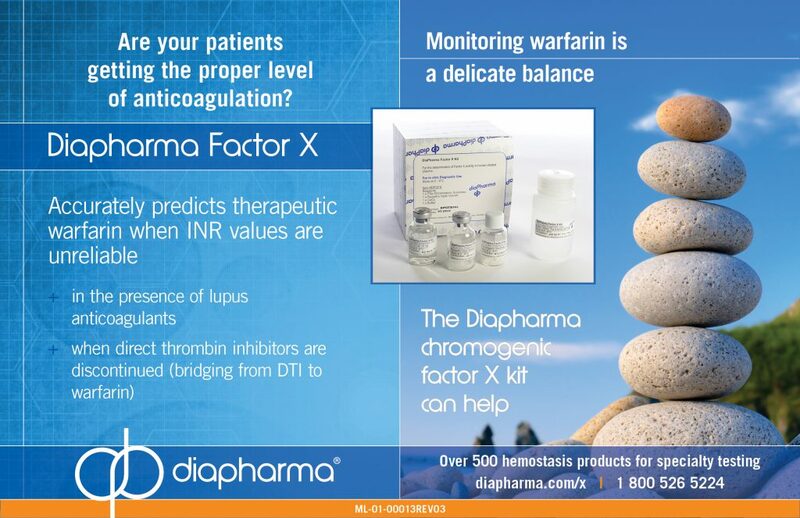 The Diapharma Factor X chromogenic assay kit allows labs to accurately predict therapeutic warfarin when INR values are unreliable, such as in the presence of lupus anticoagulants or when direct thrombin inhibitors are discontinued (bridging from DTI to warfarin). Chromogenic Substrate Preparation 25 mg lyophilized FXa chromogenic substrate with mannitol added as a bulking agent. Reconstitute substrate with 20 ml sterile water. Storage & Stability The reconstituted substrate is stable for 6 months at 2 – 8°C. Russell’s Viper Venom Preparation FX activating protein from Russell’s Viper Venom. Reconstitute the RVV with 15 ml sterile water. Storage & Stability The reconstituted activator is stable for 1 month at 2 – 8°C. CaCl2 Preparation 20 ml of 0.1 mol/L calcium chloride solution. Before use, mix 1 volume of RVV with 1 volume of CaCl2. The mixture is stable for 48 hours at 2 – 8°C. Storage & Stability The solution is stable at 2 – 8°C until the expiry date printed on the label. Buffer Preparation 100 ml buffer solution containing 0.05 mol/L Tris, pH 7.8 and 20 mg/L Polybrene® (hexadimethrine bromide). Ready for use. Storage & Stability The buffer is stable at 2 – 8°C until the expiry date printed on the label. The method is based on a two-stage principle. In stage one, Factor X is activated in the presence of calcium to Factor Xa (FXa) by the activator Russell’s Viper Venom (RVV). In stage two, the generated FXa hydrolyses the chromogenic substrate, thus liberating the chromophoric group, pNA. The color is then read with a spectrophotometer at 405 nm. The generated FXa and thus the intensity of color is proportional top the FX activity in the sample. 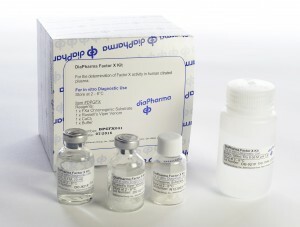 Coagulation Factor X (Stuart Prower Factor, FX) is a vitamin K dependent protein produced by the liver. It has a central position in the coagulation cascade. Factor X is activated both by the extrinsic and intrinsic systems before exerting its effect on the conversion of prothrombin to thrombin. Patients who need anticoagulation therapy can be treated with warfarin, which is a vitamin K antagonist. This treatment leads to a decrease in all vitamin K dependent clotting factors and thus a prolonged clotting time of blood. The therapy requires careful monitoring since it is essential to find an optimal balance between risk of thrombosis and risk of bleeding for each patient. The DiaPharma Factor X kit is a useful tool in the management of patients with lupus inhibitors receiving warfarin therapy.